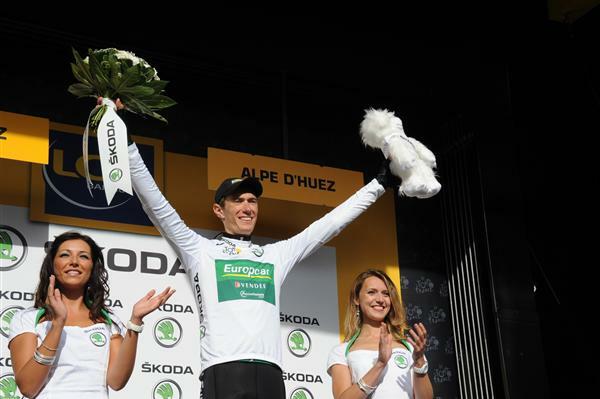 At last year’s Tour de France, Europcar set a new standard with Pierre Rolland winning a stage atop Alpe d’Huez and the white jersey as Best Young Rider, and Thomas Voeckler finishing fourth in Paris (along with 10 days in the yellow jersey). Excuse the cliché, but the Frenchmen’s exploits truly captured the hearts of French fans, giving them hope that a home rider might once again be a factor in his home tour. Rolland and Voeckler will lead the way in 2012, with the former a better (albeit it uncertain) bet for success than the latter. Rolland started the season with a stage win at the Etoile de Besseges, and has since spent his time preparing to defend his white jersey and better his tenth place finish in last year’s Tour. While high finishes have been few and far between, he appears to have put the knee injury that kept him out of Paris-Nice behind him. He’ll start the Tour healthy, but a bit under-form. As for Voeckler, his season began with a string of high finishes in the classics including a win in the Brabantse Pijl and top-10’s at Flanders, Amstel, and Liege. Unfortunately, a knee injury of his own forced him to withdraw from the Criterium du Dauphiné, the Route du Sud, and the French National Championships – a title he’s won twice. He’s starting the Tour de France, albeit with tempered expectations. After a terrific April, it really is a pity that one of the greatest stories from last year’s race might be grounded by injury. Best-case scenario: Thomas Voeckler rises to the occasion and scores a valiant stage win while helping Rolland to another white jersey and top-10 overall finish. Worst-case scenario: He abandons the race after the first weekend due to the lingering effects of his injury. Cyril Gautier finished 43rd at the Tour last year and at 24 years of age is a dark horse contender to wear the white jersey as Best Young Rider for a few days—a jersey he won at this year’s Criterium International. Pierre Rolland finally confirmed the promise he displayed several times early in his career. Now he faces the much more difficult task of proving that his performance last year wasn’t just a flash in the pan. More of a climber than a time trialist, a high finish in a Tour with three individual tests will prove that Rolland is truly something special. Aside from winning the “Turkish Beauties” competition at the Tour of Turkey last season, Christophe Kern won a stage and finished sixth overall at the Criterium du Dauphiné (and looked to be on target for a solid the Tour de France). Unfortunately, knee tendinitis (anyone else think the team needs a new physical therapist?) ended his race after Stage 5. This year, Kern is healthy, fit, and ready to make up for lost time. This entry was posted in Races, Teams and tagged 2012, europcar, kern, Pierre Rolland, thomas voeckler, tour de france. Bookmark the permalink.